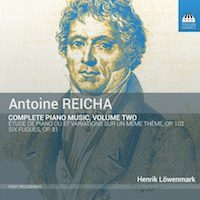 “Complete Piano Music, Volume Two.” Antoine REICHA: Six Fugues, Op. 81 (1810); Étude de piano ou 57 Variations sur un même thème, suives d’un Rondeau, Op. 102 (1824). Henrik Löwenmark (pno). Toccata TOCC 0017 (1 CD) (http://www.toccataclassics.com/). Three cheers for Beethoven! Reicha’s 57 dawdle upon an insipid ditty. It is a lot of work for player and audience to make it to the end. NO. 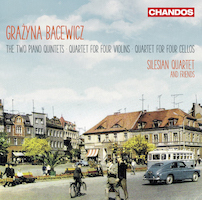 Grażyna BACEWICZ: Piano Quintet No. 1 (1952)1; Piano Quintet No. 2 (1965)2; Quartet for four violins (1949)3; Quartet for four cellos (1963)4. Silesian Quartet: Szymon Krzeszowiec1,2,3, Arkadiusz Kubica1,2,3 (vln), Łukasz Syrnicki1,2 (vla), Piotr Janosik1,2 (vlc); Krzysztof Lasoń3, Małgorzata Wasiucionek3 (vln), Wojciech Świtała1,2 (pno), Polish Cello Quartet4: Tomasz Daroch, Wojciech Fudala, Krzysztof Karpeta, Adam Krzeszowiec (vlc). Chandos CHAN 10976 (1 CD) (http://www.chandos.net/). Perhaps it’s the strange combination, but the four-cello Quartet is far more alluring than either Piano Quintet or the violin Quartet. MAYBE. 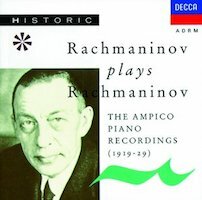 “Rachmaninov plays Rachmaninov: The Ampico Piano Recordings (1919-26).” Sergei RACHMANINOV: Var. comps. Sergei Rachmaninov (pno). Decca 425 964-2 (1 CD) (http://decca.com/). Say what you will, Rachmaninov could play, and quickly too. 18 piano rolls created at last century’s start and reconstituted 1978-79. MAYBE. 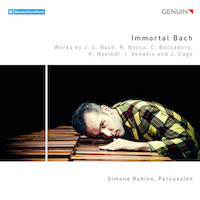 “Immortal Bach.” J.S. BACH: Suite No. 3 in C major, BWV 1009 (ca. 1717-23; arr. Eduardo EGÜEZ)1. Roberto BOCCA: Esegesi (2014)2. Carlo BOCCADORO: Power Station (1994)3. Knut NYSTEDT: Immortal Bach (1998)4. Iannis XENAKIS: Rebonds B (1987-89)5. John CAGE: Third Construction (1941)6. Simone Rubino1,2,3,4,5,6, Sergey Mikhaylenko4,6, Christian Felix Benning4,6, Patrick Stapleton4,6 (perc). Genuin GEN 17479 (1 CD) (http://www.genuin.de/). This percussion recital reminds that music is about harmony and melody (Bach). Or maybe it’s about rhythm and color (Xenakis, Cage). MAYBE. 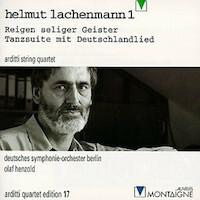 “Arditti Quartet Edition 17: Helmut Lachenmann 1.” Helmut LACHENMANN: II. Streichquartett, “Reigen seliger Geister” (1989)1; Tanzsuite mit Deutschlandlied (1979-80)2. Arditti String Quartet1,2: Irvine Arditti, David Alberman, Garth Knox, Rohan de Saram, Deutsches Symphonie-Orchester Berlin2, Olaf Henzold2 (cond.). Montaigne MO 782019 (1 CD). Upsetting, delightful and incomprehensible, Lachenmann’s expressive intensity shouldering the weight of history continues to astonish. YES. 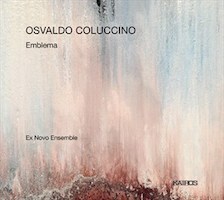 “Emblema.” Osvaldo COLUCCINO: Emblema 1 (2009-10)1; Emblema 3 (2009-10)2; Emblema 4 (2011)3; Emblema 5 (2011)4; Emblema 6 (2012)5; Emblema 7 (2015)6. Ex Novo Ensemble: Daniele Ruggieri1,2,5,6 (fl, b-fl), Davide Teodoro1,4,5,6 (clar, b-clar), Carlo Lazari1,2,3,4,6 (vln), Mario Paladin1,3 (vla), Carlo Teodoro1,3,4,5,6 (vlc), Aldo Orvieto4 (pno). Kairos 0015049KAI (1 CD) (http://www.kairos-music.com/). Precisely scripted ephemera, rubbings and scrapes that diminish several great players into nearly nothing. (No. 2 is for a larger band.) NO.